Hyperglycemia, or high blood sugar, happens when your body has too little of the hormone insulin or can't use the insulin it has properly. Consistently high blood sugar may mean you have diabetes. Symptoms, such as increased thirst and urination, can derive from not giving yourself enough insulin, consuming too many carbohydrates, stress, illnesses or hormonal surges. In addition to medical treatment, a healthy diet can help normalize your blood sugar levels and lower your risk for complications. Before making any major dietary changes, seek guidance from your doctor or dietitian. If you're prone to hyperglycemia, healthy foods and eating habits can help keep your blood sugar, weight, blood pressure and cholesterol levels in a normal range, all of which lowers your risk for diabetes. If you already have diabetes, such a lifestyle can help guard against complications, such as skin infections, eye problems and nerve damage. 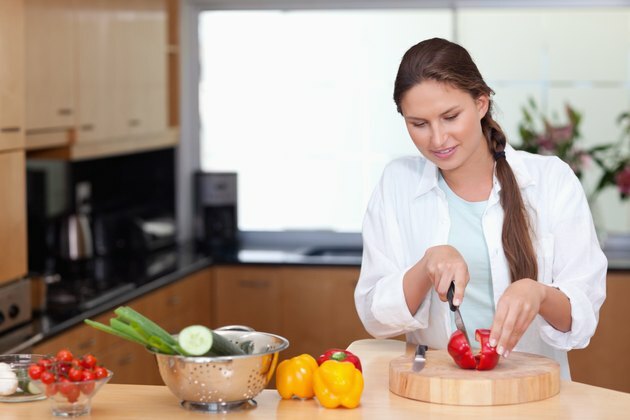 While there's no specific diet for hyperglycemia, an appropriate lifestyle emphasizes a variety of healthy foods consumed in portions and combinations that best promote blood sugar control. A diabetes-friendly dietary tool, such as the the glycemic index, the plate method or carbohydrate counting, can also help. The glycemic index measures the impact of carbohydrate-containing foods on your blood sugar. High-glycemic foods, such as table sugar, fruit juice and white flour, cause your blood sugar to rise faster and demand more insulin than low-glycemic foods, such as whole grains, nuts and legumes. Pairing foods that have a mild impact on your blood sugar, such as whole grains and lean meats, with higher glycemic foods, such as that occasional dessert, helps prevent the high glycemic foods from causing problems. Although emphasizing low-glycemic foods is one way to healthfully manage your blood sugar, the American Diabetes Association warns that portion control remains important. Luckily, many low-glycemic carb sources are high in fiber, which promotes appetite control. The plate method aims to keep your blood sugar in check by healthfully and visually managing your portions. To use this method, fill at least half of your plate with nonstarchy vegetables, such as green beans, kale, cauliflower and asparagus, then split the other half of your plate between a starchy food and a lean protein source. Choose mostly complex carbohydrate sources for your starch, such as a baked sweet potato, whole-wheat pasta or wild rice. For breakfast, have steamed veggies, for example, with a scrambled egg and a slice of whole-grain toast. Carbohydrate counting provides another useful way to manage hyperglycemia. Exactly how much carbohydrate you need is very individual, according to the ADA, and finding the right amount may take some experimenting. Your doctor or dietitian can help you calculate your carbohydrate needs. If you're unsure of your needs, start by aiming for 45 to 60 grams of carbs at each meal, making efforts to monitor your blood sugar and how you feel afterward then increasing or decreasing your intake as needed. And don't forget to balance your carbohydrate choices with protein and fat, which are crucial parts of a healthy diet. One small piece of fresh fruit, one slice of bread, 1/2 cup of oatmeal, four to six crackers and two small cookies each provide about 15 grams of carbohydrate.